Once again this year, the Economics Department proudly presents The Informant Tuesday, January 29 at 9 p.m. in the Warch Campus Center Cinema. The movie “comically” recreates the character of Archer Daniels Midlands (ADM) employee, Mark Whitacre, the principal informant in the notorious lysine price fixing scandal. Lysine is an essential amino acid used to fatten up hogs and broilers. If you mix it in with corn, you don’t have to spring for the relatively more expensive soymeal, or so I’m told. Lysine is an essential amino acid for the lean muscle development of hogs and poultry. Being a chemical compound, lysine is as close as we get to a homogeneous product. Farmers can obtain the required nutrients either through the use of soybeanmeal, or through the combination of corn and lysine… Industry experts suggest that there are no substantial costs involved in switching between these two nutrient sources. The shadow price of the alternative feed source (henceforth the “ceiling price”) can be approximated by a weighted average of corn and soybean meal prices. In the demand estimation results below, we will characterise demand as being relatively inelastic… Firms face capacity constraints. There is a great deal of heterogeneity in firm capacities, locations, and costs. Through 1990 the market lysine market was dominated by three firms with prices (as you can see) somewhere north of $1 / lb. However, in 1991 ADM opened a massive production facility in Decatur, Illinois, doubling world capacity and pushing the price below $1 toward its (probable) marginal cost of $0.66 / lb. Whitacre subsequently orchestrated a coordinated effort to fix prices among the four dominant producers (a CR4 of 95-97%), though there is some dispute as to what exactly happened. Nonetheless, price fixing is a per se violation of federal antitrust laws, so ADM was in pretty serious hot water as soon as Whitacre turned informant. On the other hand, Whitacre was absolutely crazy himself. And the movie does a good job portraying the frustration and insanity of everyone involved in the situation as the events unfolded. It seems the best defense for ADM was to simply let Whitacre unravel and leave the prosecutors to deal with him. Meanwhile, the economics of the case spawned a rather, well, let’s call it a rather spirited debate in the academic literature over the length of the conspiracy and the damages done. These are well documented in the sources below, particularly John Connor and Lawrence White, who trade body blows over the appropriate theoretical model, the appropriate choice of the conspiracy period, and the proverbial “but for” price (that is, the price that would have prevailed “but for” the conspiracy). A truly remarkable episode all around. Pop some corn and mix in three parts lysine. We’ll see you there. 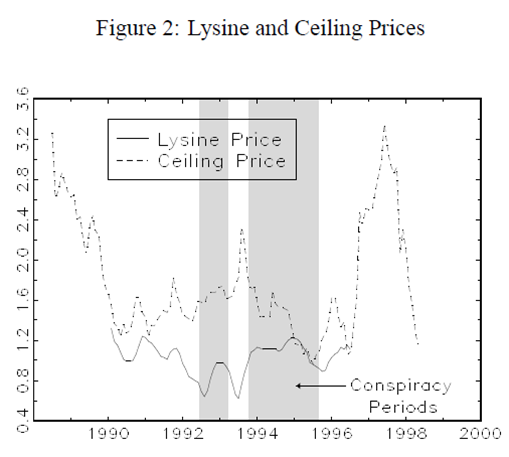 John M .Connor (1997) “The Global Lysine Price-Fixing Conspiracy of 1992-1995,” Review of Agricultural Economics, 19 (Fall/Winter), 412-427. Previous Previous post: Will Taxes Cause Golfer to Miss the Green?